Shares of the fast-casual giant surged on Monday after the chain pre-reported fourth-quarter earnings. 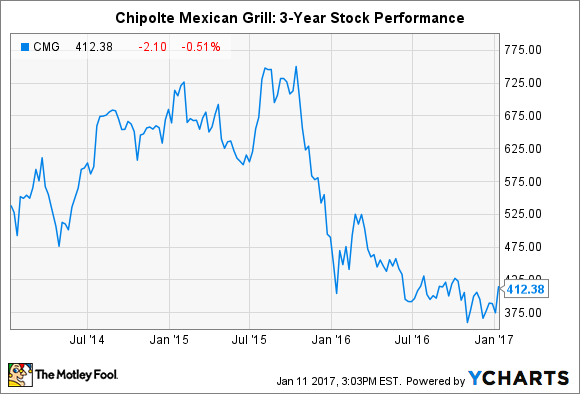 It was only a matter of time before Chipotle Mexican Grill's (NYSE:CMG) shares would begin to recover after losing 50% of their value over the past 14 months. That time, I believe, has now arrived. On Monday, Chipotle took the unusual step of pre-reporting its fourth-quarter results. Its shares surged nearly 5% following the announcement. The results at first blush don't seem like anything to write home about. Chipotle's revenue during the quarter grew a mere 4% compared to the year-ago period despite likely finishing with 200 or so more restaurants than it had at the end of 2015. Meanwhile, its same-store sales fell 4.8% in the three-month period on a year-over-year basis. Normally, a restaurant or retail company's announcement that its same-store sales are falling, and particularly by a non-negligible amount, is considered bad news and under ordinary circumstances would trigger a decline in the company's stock. But the exact opposite happened in this case. The reasoning behind this paradox can be found by digging a little deeper into Chipotle's fourth-quarter performance. More specifically, while the chain's same-store sales for the entire quarter dropped by 4.8%, there was an enormous amount of variability throughout the three months. In October, Chipotle's same-store sales were down 20%. This is roughly in line with its performance over the past year. Starting in November 2015, after the first in a series of foodborne illnesses struck the chain, its comparable sales plunged. The biggest decline was in January of last year, when Chipotle's same-store sales were down 36%. They then began a slow but steady recovery, and by September were down only 21%. Beginning in November, however, they shot up, falling by a comparatively modest 1.4%. The radical improvement can be traced to the fact that November was the first month in which Chipotle began to comp against its crisis-plagued results from the previous year. And then in December, Chipotle's same-store sales increased by 14.7%. Truth be told, this shouldn't have been a huge surprise -- or, quite frankly, even a small surprise. After all, in December of 2015, Chipotle's same-store sales fell 30%. Because that's such an easy number to comp against, it's tempting to think that Chipotle's latest fourth-quarter performance wasn't really anything special. But the problem with this perspective is that it ignores the role of psychology in investing. Namely, it doesn't seem unreasonable to think that one of the reasons Chipotle's stock has suffered so much over the past year, after previously being heralded as a respected company with a very bright future, is because the burrito chain has had to repeatedly report double-digit same-store sales declines. With those days now in the rearview mirror, that psychological component should no longer weigh on its stock. In fact, as was the case in December, just the opposite will soon be happening. Because of the impact on its sales last year, Chipotle's same-store sales for the rest of 2017 should be spectacular. It will still take time for the burrito chain to fully heal and make up for lost time. But make no mistake about it, when you look back a year or two from now, Chipotle's pre-released fourth-quarter results will mark the turning point in the recovery of its stock.